NOAA has issued a new nautical chart for the Delong Mountain Terminal, a shallow draft port servicing the Red Dog Mine, on the western coast of Alaska in the Arctic. New chart 16145 fills in historically sparse depth measurements, using new survey data recently acquired specifically for this chart. “This chart is important to the Arctic economy, giving navigational intelligence for the vessels shipping zinc and lead from Red Dog Mine, one of the world’s largest producer of zinc concentrate,” explained Rear Admiral Gerd Glang, director of NOAA’s Office of Coast Survey. The Delong Mountain Terminal is a shallow draft port servicing the Red Dog Mine, which is located about 50 miles inland. The terminal uses self-loading barges to ferry the ore concentrates to the deep draft ships anchored several miles offshore. “The shipping season from the terminal only lasts about 100 days, so shipping efficiency is vital,” Glang points out. 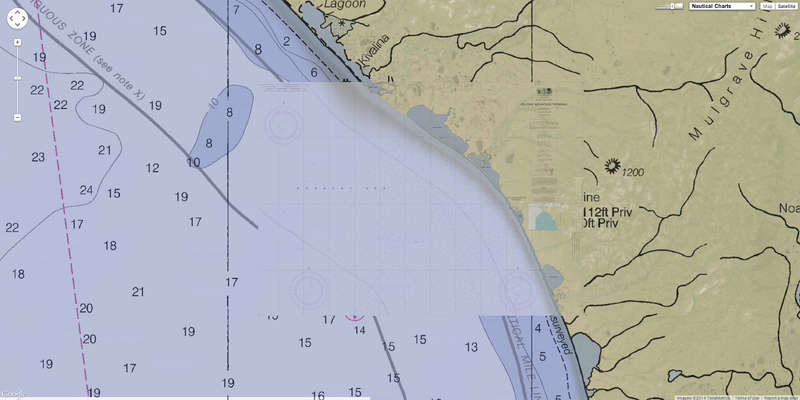 Previously, the only official nautical chart available to transit the near shore area was the 1:700,000 scale chart 16005, which shows one depth measurement within three nautical miles of the approach to Delong Mountain Terminal. New NOAA chart 16145 offers a much more usable 1:40,000 scale coverage, with updated shoreline measurements and newly acquired hydrographic information. It shows dozens of depth measurements in the approach to the terminal, representative of thousands of soundings, to give the mariner accurate depths for navigation. This is NOAA’s third new Arctic chart issued in the past three years. Chart 16161 (ENC US5AK97) for Alaska’s Kotzebue Harbor were issued in 2012, and chart 16190 (ENCs US4AK8D and US5AK8D) for Bering Strait North were issued in 2013.